Goalkeeper: With Petr Cech now at Arsenal following his summer move, Thibaut Courtois is the undisputed No.1 at Chelsea. Summer signing Asmir Begovic will provide solid back-up but he’s almost certain to be among the substitutes this weekend. Defence: Mourinho is unlikely to tinker too much from his preferred back four so we should see the same defence that lined-up against Arsenal in the Community Shield last weekend – namely Branislav Ivanovic, Gary Cahill, John Terry and Cesar Azpilicueta. Midfield: There isn’t likely to be too many surprises in midfield either with Nemanja Matic set to start along with Cesc Fabregas in the middle of the park. John Obi Mikel is clearly out of favour but Mourinho could bring in Ramires if he wants to add a bit more steel. Attack: Diego Costa is a huge fitness doubt after aggravating a long standing hamstring issue and was forced to miss the Community Shield last weekend. Loic Remy was chosen to start against the Gunners but he was largely ineffective so I wouldn’t be surprised if Radamel Falcao came in this weekend. There is likely to be a familiar look to the Chelsea attacking three with Eden Hazard, Oscar and Willian expected to start. 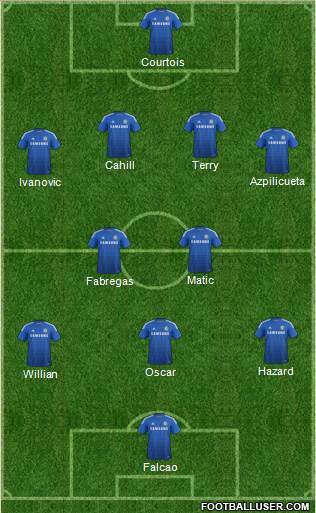 The best starting eleven with Costa not available. Go on and on to defend the title. Blues all the way!! !